I'm Megan Avery and I'm the Hipstitch Academy founder. I've been running my successful sewing studio business M Avery Designs Sewing Studio in Hoboken, NJ for over 15 years! I've become an expert in marketing creative classes for adults & kids, filling class seats, managing multiple class instructors and all the day to day stuff that comes with running your own bustling creative education business. I am confident my experience and expertise acquired over years of running my own successful business can help YOU do the same thing! Starting your very own sewing, music, art or similar studio business. Growing & scaling your sewing, music, art or similar studio business. Development of kids & adult classes that fill up. Marketing your sewing, music, art or similar studio classes. Email & social media marketing expertise. Increasing your profits & so much more. "Working with Megan and having access to the Hipstitch Academy community and blog is like having a whole business building department in your organization. I can say hands down I could not have reached $50,000 in revenue my first year without this resource. What it came down to is time. I have so much going on in my life I don’t have a lot of time to try too many things to see what works. The only way I could achieve what I have so far was to be really thoughtful about what I did and then be motivated to TAKE ACTION! Having Megan there to say, “I tried ____, and my results were _____” is a huge time saver. Planning and talking things out first is important! But the second part is putting those well thought out plans into action. Again, when I overthink things Megan has been there to say “Just do it! Doesn’t have to be perfect. Just grab some campers and get it started!”…or whatever the issue may be. She is truthful yet kind, able to find the humor in things, relatable, and full of humility. We laugh at ourselves and the situations we face as sewing studio owners and its just really nice to have someone who gets it." "If you’re wondering whether or not you should give working with Megan a try I can only speak from my own experience. It was THE best value to jumpstart my business. For under $500, with hard work and guidanceyou can start a viable business that grows quickly. The more you teach the better your sewing skills get, the more respect you garner, the more students you get. The projects I bought from Hipstitch I still use every week and will continue to do so because they are so well done. My staff loves them because the tutorials are thorough and tested training materials. I heard over and over from day one how professional my tiny operation was and I proudly let people know I had a coach and she took the time to develop and share her amazing curriculum ? …the reaction always was “that’s smart!”. I agree. It’s always smart to have support." "My training was awesome! In the last decade Megan has seen a lot. She knows what works and she is very successful! Picking her brain and hearing her story was the most beneficial part of my training. Over the last year I have run into different situations and thought to myself "oh Megan was right" or "ah ha! That's what she was talking about!" She gets really specific when she trains you and truly knows exactly how to guide you in the right direction. Megan is awesome! She has a cool confidence in everything she does with her business. 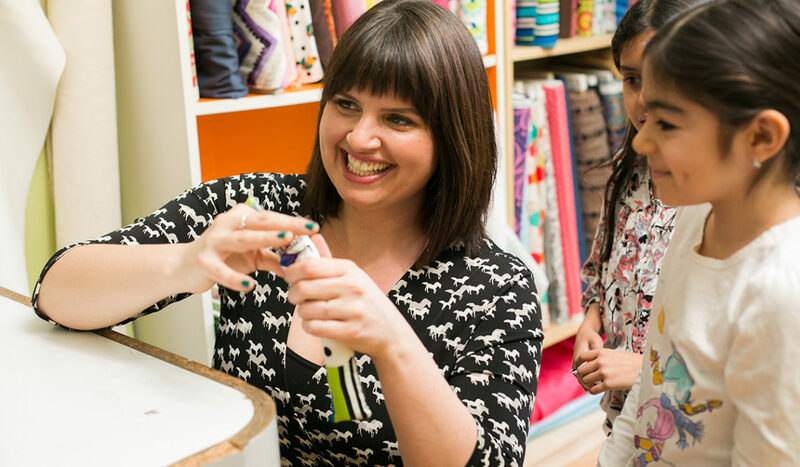 She is working hard to build a sewing community where owners can share ideas. She's truly my sewing business mentor! I talk about Megan all the time with my staff! I share her stories with them and use her experiences/advice as I'm running my business. Everyone will make the business their own but when things get tricky and you need some help she is the person you want to get on the phone." "The initial in-person training was great because it was hands-on and allowed me to see that the kids can do it. I also learned what to look for in instructors. The ongoing support from Megan has helped me keep going and believe that I can make the business work and grow. From my perspective, Megan has a good work ethic. She has built an amazing business, and she is a great asset to have in in anyone's business." Click here to contact us about doing one-on-one consulting work with Megan.